Tom and I hadn’t been to Kingfish in a while so we were very happy to meet friends there for dinner recently. Mother and son co-owners Cheryl and Cale Beck (of Beck’s Land and Sea House fame) have made many changes in the last few months, which, in my opinion, have truly enhanced the ambience. I love the bar at Kingfish. 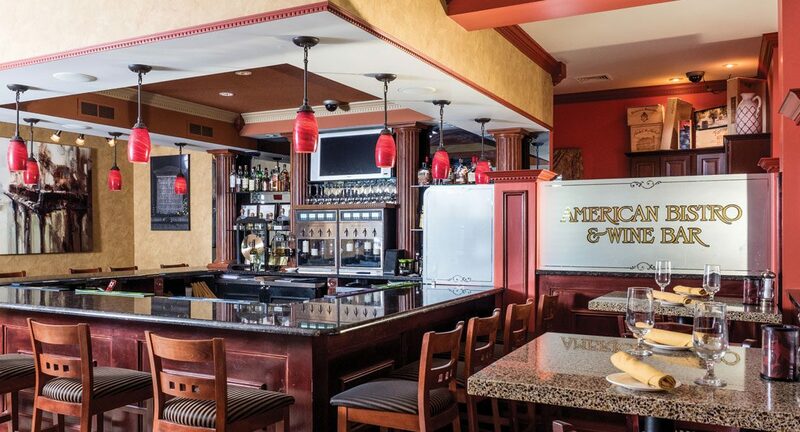 It is usually comfortably crowded with friendly patrons enjoying a drink and appetizers or catching up with game scores on the widescreen. We were seated in the corner of the dining room and greeted by Raychel, our excellent attentive server. We immediately noticed the new deep red-orange walls and woodwork upgrades as well as lovely new photographs and attractive artwork. The addition of acoustical sound boards on the ceiling really soften the noise that was always a problem for me with the former owners. We started with the Charcuterie Plate with a tasting pairing of three red wines. (Served from their Wine Access System that holds eight bottles at perfect temperature and humidity, and allows for perfect one, two or six ounce pours). This amazing appetizer was served on a lovely wooden cheese board and included Danish blue cheese, house smoked Bratwurst, smoked Gouda, chorizo, Gruyere and salami all accompanied by candied pecans, roasted asparagus as well as a sundried tomato and onion tapenade. It was wonderful and large enough to share among us but is more than enough to enjoy as a meal. The cheese selection was interesting and fresh and the Bratwurst was incredibly lean and delicious. There are many delicious appetizers on Kingfish’s menu as well as a large selection of fresh sushi and raw bar items. We also shared the Sicilian Clams with sweet Italian sausage, hot peppers, leeks and white wine broth. This appetizer was a very savory blend of flavors with a zippy sauce just perfect for dipping the crusty bread that surrounded the clams. We all loved this appetizer and Tom plans to visit again and have this appetizer for dinner. To round out our starters, we shared a Caprese Salad of heirloom tomatoes, fresh mozzarella, basil and a rich balsamic reduction. I loved this salad. The Sweet Balsamic reduction added a rich flavor to the fresh cheese. Wonderful. 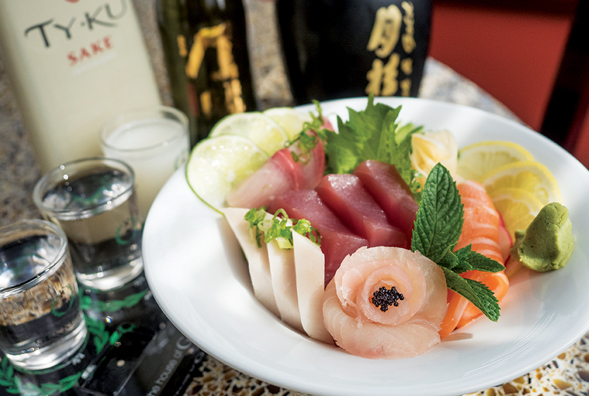 There are many delicious appetizers on Kingfish’s menu as well as a large selection of fresh sushi and raw bar items. There are also soups, salads and artisan pizzas for lighter appetites. Better yet, select a few items to pass and share. This menu is perfect for that. It was the goal of Cheryl and Cale Beck to create at Kingfish an unpretentious dining experience with a more contemporary twist on their fish dishes. So far, so good! 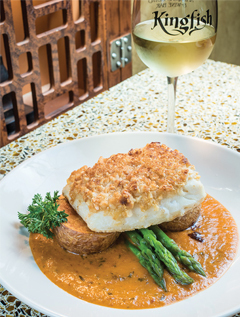 Tom and I ordered the night’s special – roasted macadamia nut crusted Waimea Bay Halibut with lobster cognac sauce and grilled asparagus served atop a halved crispy red potato. This dish was very delicious and extremely rich with a portion so generous that more than half the meal went home with us. The halibut was extremely fresh which is the most important factor for any seafood house. Bob enjoyed the Seared Tuna which was beautifully presented. The sesame-encrusted tuna was seared rare, thinly sliced and placed upon a ball of sticky rice. It looked beautiful and with the warm soy butter, pickled ginger and zesty wasabi, tasted even better! We all loved this entree. Nancy rounded out the table with her TNT Roll – a fried Tempura battered California Roll with crab, avocado, cucumber and spicy sauce. I loved this Asian selection. I must mention again that all the meals we ordered were more than generous so keep that in mind when ordering. Other seafood entree selections include Jail Island Salmon with ginger, chilies, sweet teriyaki and broccoli; Bronzed Chilean Sea Bass served Oscar Style with asparagus and hollandaise; and South African Lobster Tail. There is grilled steak and other meat selections for landlubbers and you may create your own Surf and Turf with many meat and seafood options. So, as you can see, there truly is something on Kingfish’s menu to satisfy anyone’s tastes. Just when we thought we could not eat another morsel, we asked, “Why not have dessert?” So we ordered Key Lime Torta with Roasted Strawberry Jam and the Salted Caramel Budino. Both of these deserts were very good but Nancy and I agreed that the Budino was the winner because of that always wonderful combination of salt and caramel. Both desserts were very sweet and with fresh hot coffee, topped off a delicious meal and fun evening. Kingfish has a private dining room that was beautifully decorated for a bridal shower when I visited. This room will accommodate up to 100 guests and is appropriate for any occasion, from business (complete with a flat screen for powerpoint presentations), to a small elegant wedding. Executive Chef Cale Beck is self-taught and worked alongside his parents at Beck’s Land and Sea in Nazareth (where his father Randy still rules). He has taken the menu up a notch at Kingfish and only has great hopes for the future of this busy and fun dining establishment. Kingfish is located at 3833 Freemansburg Avenue in Bethlehem and there is plenty of on-site parking. For more information, call 610.691.1115 or visit kingfishbethlehem.com.